When planning our month long trip to southern India, I spent weeks researching various route options. We knew we wanted to stick to mostly the state of Kerala, with possible stops in Karnataka and Tamil Nadu. But there just didn’t seem to be a logical order and flow of travel to get to where we wanted to go. Also, although India has lots of transportation options, it takes way longer then you would expect to make a simple journey. If you are trying to figure out what places to visit in Kerala, I will share with you three possible Kerala itinerary ideas based on our experience. There are so many wonderful things to do in Kerala. From the green and lush Backwaters, to the rice fields of Munnar, to the beautiful beaches and rich culture, Kerala is often billed as “India-lite”. Kerala is much more laid back than northern India; less chaotic, less pollution, friendly people and delicious cuisine. While we chose to spend almost 4 weeks in Kerala, you can do a short loop and see the highlights of Kerala in 5-7 days. I have included my recommendations of where to go and what to see if you are visiting for a week (see below). I have also included Kerala accommodation recommendations. First time to India? Read my post on A-Z Taking Kids to India post. Are you headed to the north? Make sure you read these Taj Mahal tips. Begin your Kerala itinerary by flying into Kochi (previously and often still referred to as Cochin). You will want to stay in Fort Kochi, which is the picturesque old trading port which at different times in history was ruled by the Portuguese, Dutch and British. 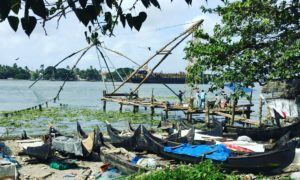 The most photographed attraction in Fort Kochi is the Chinese fishing nets, where groups of men work together to raise and lower these huge nets into the waters. Fort Kochi is best explored by rickshaw and wandering the streets and taking in the history of the heritage buildings and streets. Highlights include the the Santa Cruz Basilica, St Francis Church, and the Dhobi Khana laundry. Make sure you visit nearby Mattancherry to see the impressive Dutch Palace and explore Paradesi Synagogue and Jew Town. Round out your visit with a Kathakali performance and a trip out on the public ferry to Ernakalum. Read more about visiting Kochi here. Fort Bridge View (Budget) – We stayed here and found the rooms to be really large with nice heritage accents. The staff brought in additional mattresses for the kids. Breakfast was included and was really good – fresh juice, eggs and fruit. Modern bathroom, good air conditioning and in a good location in the heart of Fort Kochi. Check latest prices here. Saj Homestay (Budget) – Consistently receives excellent reviews for its simple, but clean rooms. You can’t go wrong with the excellent Keralan hospitality here and delicious food. Check latest prices here. Tissa’s Inn (Mid-Range) – Well located with a roof top pool in a historic building. Restaurant has good food and service. Check latest prices here. Tea Bungalow (Premium) – Located in an old colonial house with only 10 rooms, Tea Bungalow has clean and quaint room. There is a small swimming pool and friendly staff. Good location right in the centre. Check latest prices here. Kochi Marriott (Premium) – Read out full review here. This hotel is not located in Fort Kochi, but on the mainland. It offers a great place to stay before an early flight or when you first arrive. Fabulous rooms with excellent amenities and the best staff, make this a great choice. Check latest prices here. The Backwaters is often the main draw for visitors on a Kerala trip and the typical thing to do is to spend a night or two on one of the converted rice barges that ply the waterways. I read lots of reviews both positive and negative about spending a night on one of the boats and we opted to stay on land and go out on a hand powered small boat trip. There is increased feeling that the pollution from these tourist boats and the large number of boats on the waterways are becoming unsustainable. No matter how you choose to enjoy the Backwaters, it is a beautiful place to visit. Village life goes on as it has for centuries and the lush palms and meandering waterways will entice you to stay longer. What you should do here is simply relax and take in the rural life of the Backwaters. Do get out on the waterways to see how the water is central to the way of life for people in this region. Getting There: From Kochi, you can take the train or bus for a couple of hours to Alappuzha or hire a driver. Read more about how much we enjoyed the Backwaters here. Backwater Farmhouse (Budget) – a steal at 1000 rupees/night ($20 CAD) for a cottage with a big bed and two extra mattresses. Rooms are basic, but you have a lovely porch that you can sit out on and watch backwater life go by. Bathroom is attached, but open air and attracts lots of bugs (cold water and no toilet paper). This place is a bit hard to get to and feels off the main tourist track. We stayed here and thought it was a great option. Visit their website or call to book. Lake Canopy Resort (Moderate) – this is a new Western style resort located directly on the lake. There are lots of free activities included. The rooms are large and comfortable and the pool and grounds are well cared for. Click here to check their latest prices. Green Palm Homes (Moderate) – a family-run home stay on an island surrounded by rivers and ricefields. They have a variety of room options on a full-board basis. The family is committed to improving the community and eco-tourism. Visit their website to book. Kondai Lip Backwater Heritage Resort (Moderate) – this resort is set in beautiful grounds with lovely cottages. You reach the resort by boat, which is a great introduction to this tranquil spot. You can take the free boat tours or bicycle tour around the Backwaters. Click here to check their latest prices. Munnar is India’s largest tea growing region and is a spectacular carpet of manicured green. Even if you have visited other tea growing regions, Munnar is worth adding to your Kerala itinerary. The higher altitude makes for a great escape from the humidity of the coast and the mountainous scenery is breathtaking. Unlike other tea regions we have visited, there aren’t any tea plantations to stop in and visit although the Tea Museum, is worth a look. The best way to see the area is by hiring a driver or doing a guided hike. 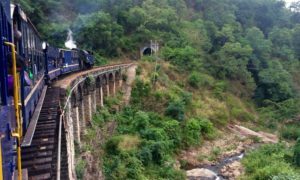 For many visitors the highlight is a drive up to Top Station, near the Tamil Nadu border, where you will be treated to awesome views over the Western Ghats. Eravikulam National Park is the place to go to spot the endangered Nilgiri tahr and it is best to go early in the morning. Getting There: Munnar is a 5 hour drive from the Backwaters or Kochi, along a winding road that ascends into the mountains. You can take a bus or hire a driver and car. Read about our Munnar Highlights here. Royal Mist Homestay (Moderate) – this place is #1 on Tripadvisor for a reason! Anil and Jeeva are amazing hosts and have created a wonderful 3-room homestay. The rooms are well designed with lots of amenities and we loved eating meals on the balcony surrounded by tea fields and jungle. Jeeva makes lovely meals that are included and was really accommodating with our kids’ tastes. Book directly on check the latest prices. Olive Brook (Moderate) – cute cottages set in a plantation away from everything, Olive Brook is a wonderful place to relax. Take the complimentary tour of the farm and learn more about the things that are grown here. Click here to check the latest prices. Spicetree Munnar (Premium) – this beautiful retreat offers up amazing views of the teafields and premium service. Some rooms even have their own private pool. Excellent food and lots of activities offered mean you don’t ever need to leave the hotel. Click here to check the latest prices. From Munnar, you will need to return to Kochi for your flight out. This rounds out our suggested 7 day itinerary of places to visit in Kerala if you enjoy tea fields. If you are more of a beach person, read on for option 2 of our 7 day Kerala itinerary. Varkala is a great beach destination in your Kerala itinerary. It has that laid-back hippy feel to it, beautiful cliffs overlooking the ocean, lots of budget accommodation options and cute cliff side restaurants. While the ocean was rough for swimming while we were there in September, we made sure to pick a place with a pool for the kids. You can spend your days browsing the Tibetan merchandise at the shops, eating delicious curries or Western food at the cliff top restaurants and walking the beach. Make sure you enjoy lots of fresh coconut water from the beach side vendors. October to March is the best (and busiest) time to visit Varkala. Getting There: Varkala is just over 100 km from Alappuzha. You can take train, bus or hire a driver. 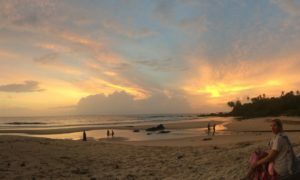 Read about our time in Varkala here. Akhil Beach Resort (Budget) – this is where we stayed and we were really happy with it. The big draw for us was the pool and lovely grounds. Rooms were average. It was just a short walk to all the resturants on the cliff. Click here to check the latest prices. Maadathil Cottages (Moderate) – offers 10 seaview cottages just outside of Varkala. Guests rave about the level of service and peaceful setting. Book directly on check the latest prices. Palm Tree Heritage (Moderate) – beautiful grounds and a lovely beach, this hotel is away from the crowds. The rooms are good and service very good. Click here to check the latest prices. Instead of returning to Kochi, fly out of Thiruvananthapuram, just 43 km away. 3 nights Kochi – a great introduction to Kerala, you definitely want to stay in Fort Kochi. 2 nights Backwaters – we chose to stay in a quiet home stay, instead of on a rice boat. It was a great opportunity to see village life and relax. 3 nights Varkala – we loved the hippy vibe of Varkala with its clifftop restaurants and chill atmostphere. 3 nights Periyar – we came here to see Periyar Tiger Reserve and while we didn’t expect to see tigers, we hoped to see some wildlife. We found the park to be overly commercialized and not worth the detour. There are much better wildlife areas in India to explore. You can read our full report here. 3 nights Munnar – a welcome respite from the heat, Munnar is a peaceful area to view the tea fields. 3 nights Kannur – a beachside town in northern Kerala, Kannur is off-the-beaten path and known for its theyyam rituals, which we had the opportunity to view. You can read our full report here. 3 nights Wayanad – home to Tholpetty Wildlife Reserve, Wayanad is a very rural area with a large tribal population. There are lots of opportunities to view wildlife, waterfalls, and plantations. You can read our full report here. 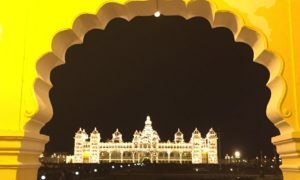 3 nights Mysore – located in Karnataka state, Mysore is known for its beautiful palace and yoga scene. We really enjoyed being back in a city and there are lots of interesting things to do to keep your busy for a few days. You can read our full report here. 1 night Coimbatore – from Mysore, we had a few days to get back to Kochi. We had originally planned to spend a few days in Ooty, in Tamil Nadu. Ooty is a hill station with a cooler climate and the famous Nilgiri Mountain Railway. We found it very cold in Ooty and continued on to Coimbatore, which was simply a stop-over on the way to Kochi. 1 night Kochi – we spent our last night at the Marriott Kochi, which was such a nice treat after weeks of backpacking. Read this post for some other great places to visit in Kerala. We can’t say enough good things about Kerala. It’s slower pace, lush green scenery and friendly people, make it a great destination on its own or as a break from busy northern India. You can see the main highlights in the 7-day Kerala itineraries above, or spent even longer exploring the beaches, rice fields, wildlife and culture. Do you have any questions about Kerala I can help you with? If you have been, what did you like the most about the region? January 2018 Expat Update - We have a Plan! It really is an awesome area, so hope you get there soon Nicky. It reminded us of Sri Lanka in many ways and was a great introduction to India. It really is a great destination Jemma and somewhere we would love to go back to! 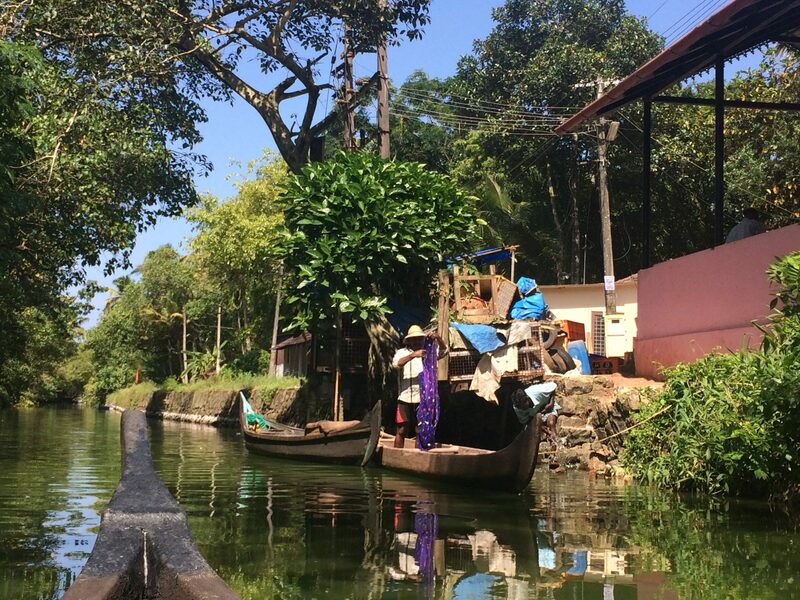 Kerala is such a perfect introduction to India, so definitely put it on your itinerary when you get to India. Nepal is next on our list – so excited for that! Nepal was amazing, I’d love to return one day. Kerala is somewhere I’m desperate to visit! I’d love to do the backwaters and some of the tea plantations! It is one of those areas Leona that offers up so much. Hope you guys get to visit soon! It looks really beautiful. We had a 4 nights stopover in Chennai on the way to Sri Lanka. It was busy, dirty and hard to get around. We loved the food, people and the sights but I found it tough with kids and it put me off returning to India for a while. Your photos look like it was very laid back and clean! I have friends that have visited Kerala a number of times and now I can see why. I’ll definitely be reconsidering India with kids now. Kerala really reminded us of Sri Lanka, so if you liked Sri Lanka, I think you would really like Kerala. It is definitely more laid back, cleaner and very green compared to the North. The hardest thing for our kids was eating foods they liked (similar issue in SL). I really do think Kerala is more like Sri Lanka than northern India. It really is a great first step to exploring India. We now feel more confident to tackle the north now! Wow, what an amazing itinerary. I love that you have different options for places to stay and that you’ve given your honest opinion of the ones you used. I can’t believe the price on some of them, brilliant! Thanks for linking up to #FamilyTravelTips. Thanks! I found it hard to find a lot of information about independently traveling around Kerala with kids so hope it will be helpful for families planning a similar trip. Woow!! What should i say about Kerala – The incredible God’s Own country. I have been to Kerala about 3 times, and every time the backwaters offer something extraordinary. From roaming to tea gardens to visiting temples, Kerala in southern India is a remarkable Beauty. Thanks Jenny! We are so eager to visit northern India, but that will have to wait until 2019! What an amazing #familytraveltips experience and great itineries! I love the look of the tea fields! It is a great region to explore and the tea fields are beautiful!